Delicious Vanilla Cheesecake, Buttery Biscuit Base, SO MANY CREME EGGS, and a Chocolate Drip… Hello No-Bake Creme Egg Cheesecake! 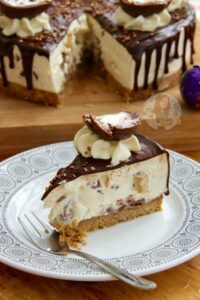 I am obviously obsessed with cheesecake, this is nothing new to my regular readers, but I felt like this recipe was an absolute must. Like, its Easter soon… Creme Eggs are back… so hello NO-BAKE CREME EGG CHEESECAKE! Heaven. 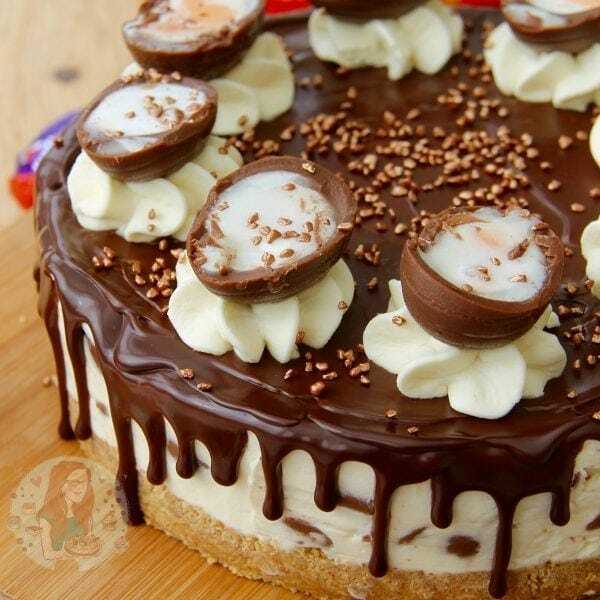 Like cheesecake heaven. 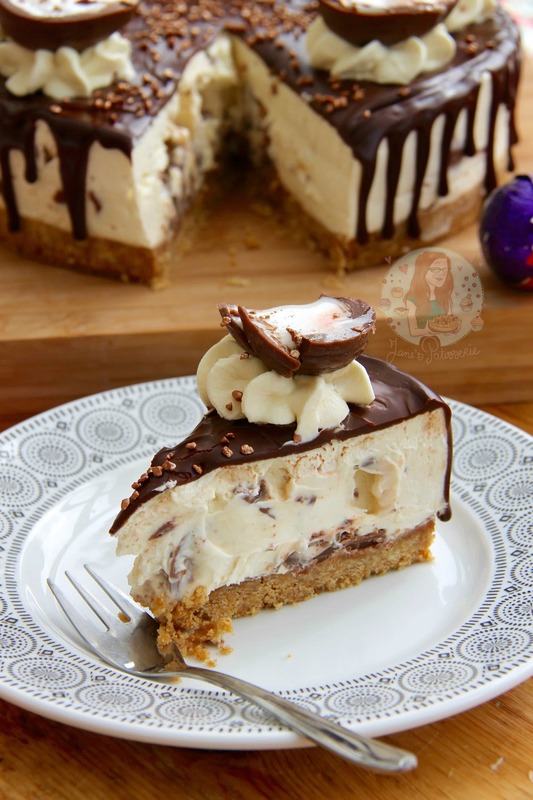 The other day I posted the recipe for my No-Bake Mini Egg Cheesecake and it was an astounding hit – like I was surprised at how well it was received (hehe thank you!) and after the downright success of my Mini Egg Drip Cake I thought that marrying these ideas together to make a Creme Egg Easter treat was perfection. 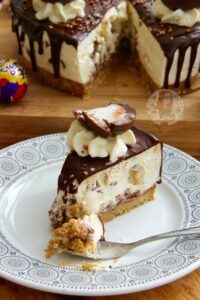 The buttery biscuit base combats well against the sweetness of the filling, and as creme eggs are so sweet I went with Philadelphia for my Full-Fat Cream Cheese of choice as the tang of it compares well with the sweetness and sugar. However, if you aren’t a cheesecake fan but still want to try it, you can easily use Mascarpone! Or even use a mixture of the two. As long as the weight value is the same, it’ll be dandy! 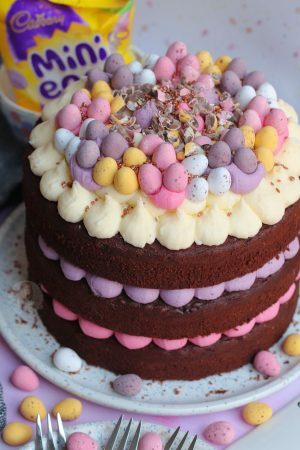 I used 4 bags of Mini Creme Eggs in the filling, and could have done more.. but there is a limit to how much one can handle in a slice. (Just kidding, I only had 4 bags, but it is quite a lot.) It’s much easier to chill them first before you cut them up otherwise it’ll just turn into a sticky mess, but thats entirely up to you. 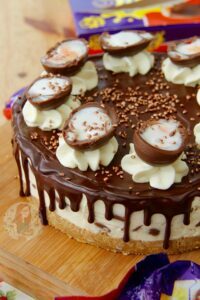 As there are quite a few creme egg cheesecake recipes out there, I went with what I thought was best, basing it on my own recipes and giving it a drippy twist! I did however decide to use a bit more cream in this recipe compared to the usual so that it lightened the texture against the sweetness, which worked perfectly. Yummyyum. I will always try to use a Dark Chocolate for a drip because it just works better. It’s only a 1:1 ratio of Chocolate to cream, but if you want to change the chocolate, the ratios do change. For me, Milk Chocolate would be 2:1 Chocolate to cream, and white Chocolate is 3:1. It sounds like you’d need more cream with the White Chocolate, but you really don’t. You could even make this into a Chocolate Cheesecake if you wanted. Simply add in 250g of melted chocolate to the mix, and take out 150ml of Double Cream from the mix. The possibilities are endless and DELICIOUS. Even with my Cadburys Caramel Cheesecake, you can see how adaptable they all are. 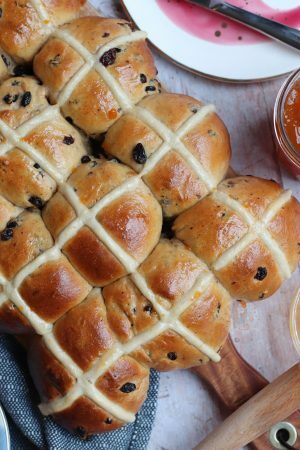 Once its thick, fold through the chopped up creme eggs (You might find it easier to chill/freeze the creme eggs first so that its not too messy!) Spread the mixture onto the biscuit base and spread evenly. Leave to set in the fridge, covered, for 5-6 hours, or preferably over night. In a small pan, heat 100ml of double cream until its just below boiling point, and pour over the finely chopped chocolate and leave for 5 minutes to just sit. After the 5 minutes, stir until smooth and leave it to cool for about 10 minutes. Whip up the 150ml of Double Cream with the Icing Sugar. 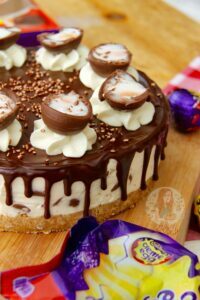 Pipe a little onto the cheesecake, and add a large creme egg half to each floret of cream and sprinkle with your favourite sprinkles! Leave the ganache to set for a little while longer and then ENJOY! 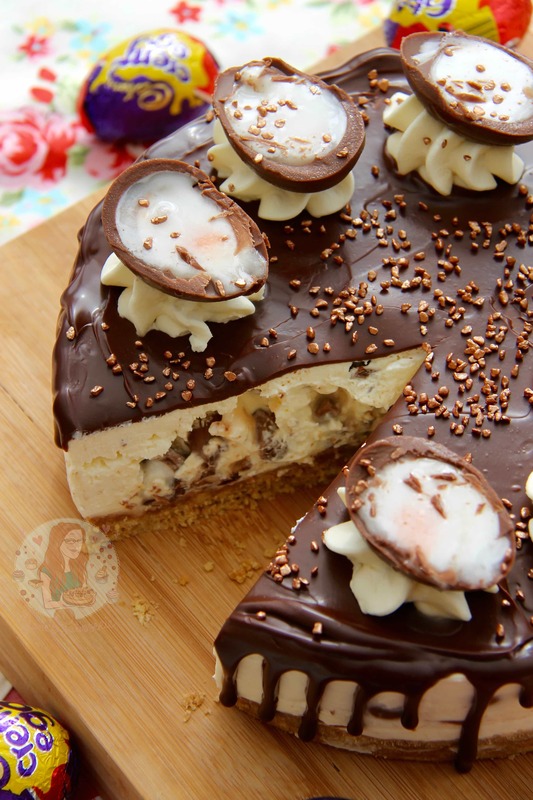 Creme Eggs are naturally quite runny so its probably MUCH better to chill/freeze them before cutting. All of the decorations I have done are optional so don’t worry, the cheesecake will still be delicious either way! The Ganache is completely optional and can be ignored if you wish! I use either Full Fat Philadelphia Cream Cheese, or full fat Mascarpone. Older Next post: Lemon and Poppyseed Cupcakes! 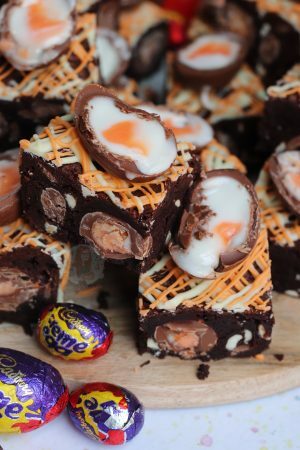 Newer Previous post: Mini Egg Fudge! 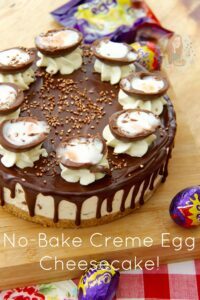 Ive done your mini egg no bake cheesecake and it’s amazing, only problem was I followed the ganache recipe from this to top my cheesecake but the ganache was really runny, I used milk chocolate and double cream but I don’t know where I went wrong? Any advice for next time? Its because you used milk chocolate – as per the recipe, you need to use dark chocolate. Could I use Milka Philladelphia instead of the standard? 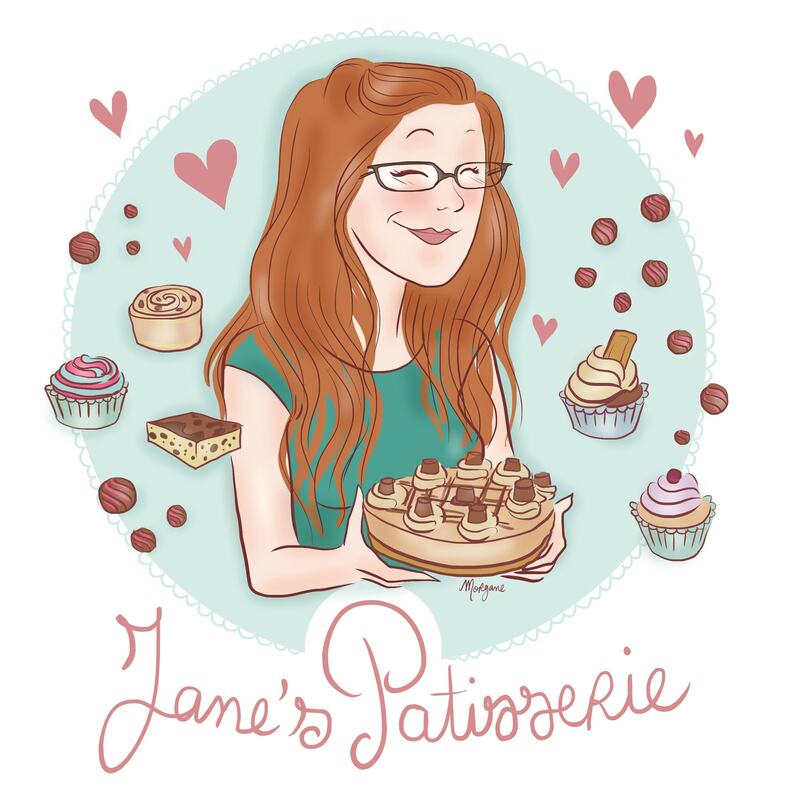 It’s definitely worth a go, I just haven’t used it in a cheesecake yet! Why are some cheesecakes 500g and some 550 or 600? Because it depends on the type of cream cheese you use, and their packet sizes. Also, some I prefer with a bit more, some with a little less. You can – as long as it’s full fat! I’d say my recipe is quite firm, but you can add some lemon if you wish. This looks so impressive! 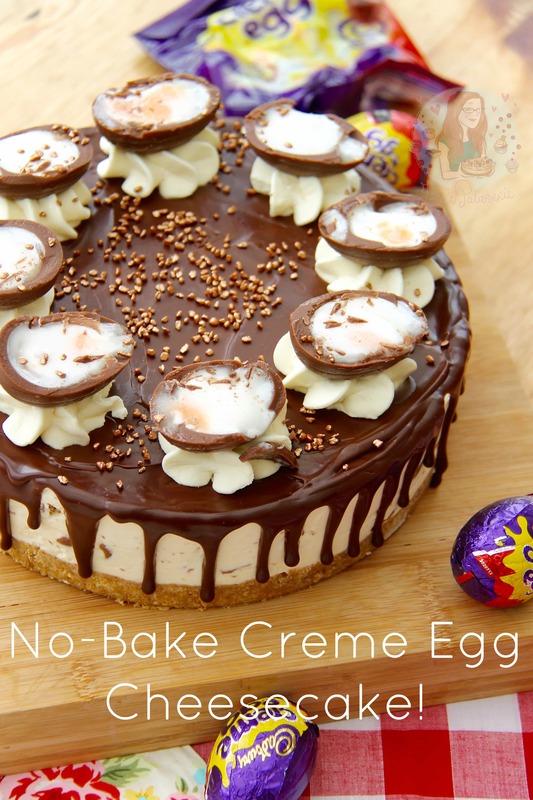 I don’t actually love creme eggs, I find them too sweet but the boyf would love this! I’m the same with Creme eggs, but the Philadelphia tang made it not too sweet 🙂 thank you so much!